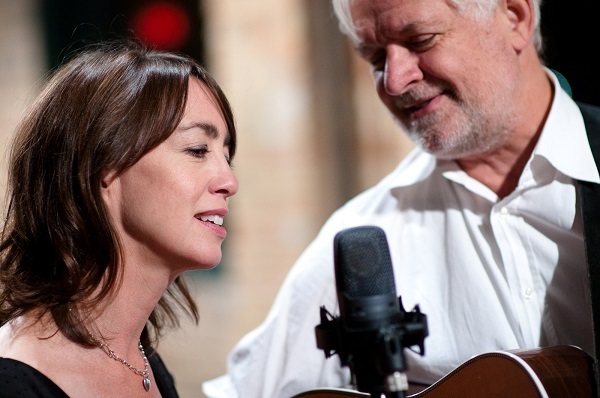 Bill & Kate Isles will be performing on Saturday, April 27, 7:30 p.m., at the Original Congregational Church in the center of Wrentham. They are an acoustic singer/songwriter duo based in Duluth, Minnesota. Using a wide variety of musical styles, their performances carry audiences through a broad landscape of experiences from metaphorical worlds to small town family stories and to zany comedy. Consummate performers, they are known for their catchy melodies and memorable songs. They have a deep-seated love for the audience, and each other, and it shines before, during, and after the performance. They tour nationally, presenting their profound songs for audiences large and small, from house concerts to festival stages and everything in between. Words like ‘Mesmerizing, ‘Transcendent’, and even, ‘Hysterical’ are common descriptions from audience reviews and audience members feel that they are listening to stories of their own lives, told by two of their best friends. Since that time, he has become one of the most well known singer/songwriters in the Minnesota acoustic scene and has been getting national and international attention. Kate Isles (Born in Tecumseh, NE, raised in Rochester, MN) came to the CD release concert for Bill’s first CD, “Weightless” after hearing a public radio interview. She bought the CD and signed up on his e-mail list. (‘Grounds for marriage!’ quips Bill). Their song, ‘Public Radio (A True Story)’ is a delightful duet that chronicles these beginnings. Their relationship began in the ensuing months as they enjoyed afternoon sessions with guitars, harmonies and coffee. They’ve been together ever since, marrying in May of 2004. They have toured nationally as a duo, full-time, since early 2007, performing 100-150 shows per year. Their late-2011 duo album, ‘Still Beneath the Stars and Moon’, includes ten new original songs, and showcases their respective songwriting with several of Kate’s songs as well as a few they’ve co-written. The response has been very positive with many comments such as ‘We’re wearing out your CD, we listen to it all the time!’; and ‘It’s the perfect blend of two voices’. The event will be in the Fellowship Hall at the rear of the church. Parking is available behind the church and in the lot across the street. For more information and to be added to the mailing list, visit the website or contact Ken Graves, 508-384-8084, occmusic99@gmail.com.